Are you scared to open your closet door? Is it piled high with clothing, shoes, accessories, and all the other items you can’t find room for? The good news is, you can organize it. The even better news is, it won’t take a lot of time. 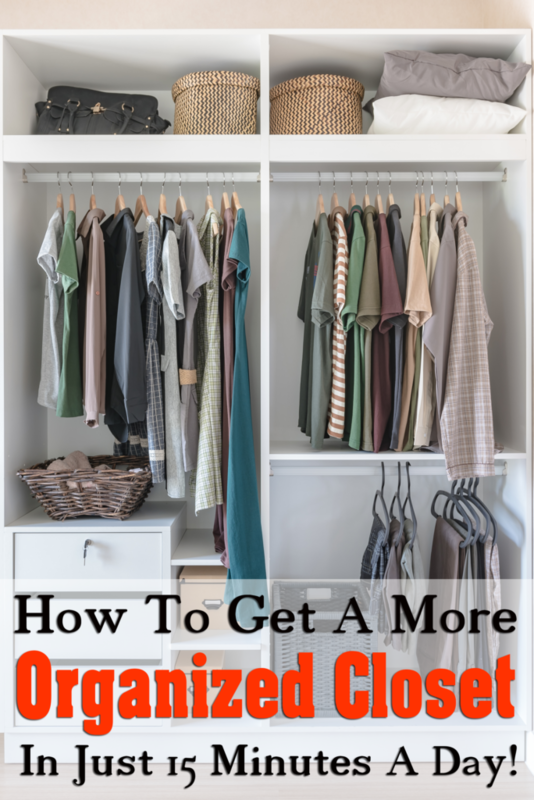 Check out these great tips on how to get a more organized closet in just 15 minutes a day! Fifteen minutes is all it takes to have a cleaner, more organized closet that you can enjoy. Look at these 6 organization tasks that take 15 minutes or less, and when done daily can keep your closet looking great. Choose just one task per day and see what a difference they can make over time. 1) Weed out and donate at least one item you haven’t worn in six months. It takes less than 15 minutes to go through your closet and remove items you haven’t worn in 6 months. Weed out these items and donate them to a local thrift shop or consign them. This is an easy way to clear away excess clothing and create more space. 2) Pair up your shoes so all matches are together. Take 15 minutes to pair up your shoes so all pairs are together. This saves you time in the long run when you are grabbing a pair of shoes since they will all be together. If you still have shoe boxes, assemble pairs in the boxes for easy storage. 3) Place Command hooks on the walls for ties, jewelry, and belts. It only takes a few minutes to peel and stick Command hooks on closet doors and walls. Then fill these hooks with loose items like belts, ties, and jewelry. This keeps these items off the ground and keeps the space more organized. 4) Take a bag and spend 15 minutes removing items that don’t belong in the closet. Grab a trash bag and take 15 minutes to remove any items that don’t belong in the closet. Chances are all sorts of none clothing clutter has made its way into the closet, so take this time to weed those items out and make more space. 5) Assemble an over the door organizer. You can place an over the door organizer on the door in just minutes and use the storage pockets for undies, socks, ties, and other clothing accessories. This is a great way to keep all of these small items organized while using very little space. 6) Turn all your hangers the same way. Invest a few minutes in turning all your hangers the same way. This will help keep items on the hanger and off the floor since they will be easier to grab and go. While you are at it you can also move clothing according to the season to the front or back of the closet. Another great idea is to try space saving hangers to expand the room for a larger wardrobe. As you can see, you can work your way towards a more organized closet in just 15 minutes a day. These tips can help you achieve more space, eliminate clutter, and feel more at peace every time you open the door. What great closet organization tips do you have? We’d love to hear from you!